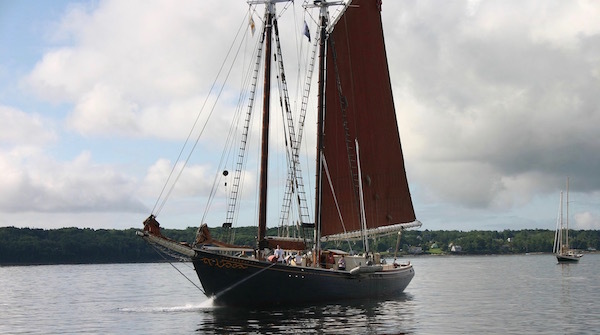 The educational schooner Roseway is coming to Greenport on the Fourth of July, with an expected arrival of 9 a.m., according to Greenport Village. She will dock at the village’s Railroad Dock and will be open for free on-deck tours from 2 to 6 p.m. The vessel is slated to depart the following morning. Roseway, now operated as a school by the World Ocean School, is is a national historic landmarked wood gaff-rigged schooner, first launched in November 1925 in Essex, Mass. from the John F. James & Son Shipyard. “She was commissioned by Harold Hathaway of Taunton, Massachusetts, and was named after an acquaintance of Hathaway’s “who always got her way.” Despite her limited fishing history, Roseway set a record of 74 swordfish caught in one day in 1934,” according to the school’s website. The ship, the only known surviving example of a fishing schooner built primarily for racing, has suffered a sinking and been refloated, and had been used as a pilot boat in Boston Harbor, where she protected the harbor with the First Naval District (New England) during World War II, outfitted with a .50 caliber machine gun. Roseway was retired by the Boston Pilot’s Association in 1973, after which she became a tourist passenger vessel, and her condition began to deteriorate. After Roseway was repossessed by the First National Bank of Damariscotta, ME, the bank donated her to the newly formed World Ocean School in 2002. She then underwent two years of restoration in Boothbay Harbor, ME before she was relaunched as an education vessel in 2005. More details on their work are online here.